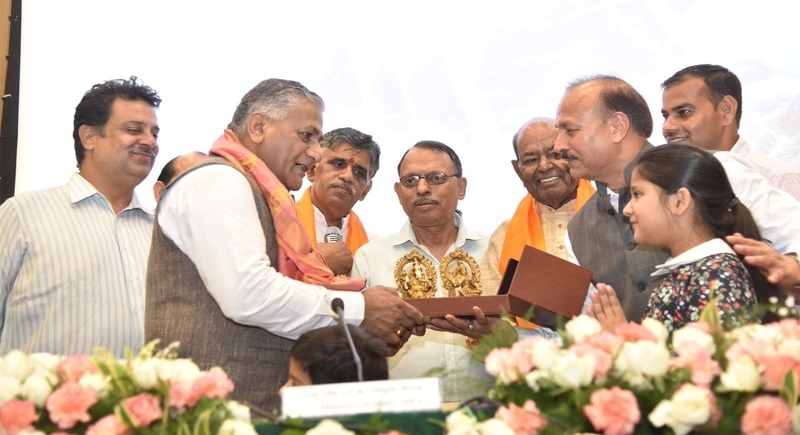 New Delhi, June 11: Hoping the pilgrims of the much awaited Kailash Manasarovar yatra 2018 conclude their journey smoothly, Union Minister of External Affairs general V K Singh flagged off the first batch comprising 60 yatris. Soaring hopes and joy, General V K Singh hoped the journey to conclude smoothly and also counseled them to remain physically fit and establish communion with nature to come out rewarded from the Yatra. The first batch comprising 60 pilgrims will reach Kailash Manasarovar via Lipulekh. There are two routes for Yatra-through Lipulekh pass (Uttarakhand) and through Natu La pass (Sikkim). Addressing the session, General V K Singh said, "This year 3,734 applications were received. After the lucky draw process, around 1500 were selected for the Yatra." Pilgrims will reach Kailash Manasarovar via Lipulekh in eighteen RPT eighteen batches of 60 pilgrims each. Ten batches of 50 pilgrims each will reach there via Nathu La, he said. The duration of the Yatra via Lipulekh is 24 days for each batch including three days in Delhi for preparatory work. This route passes through important sites like Narayan Ashram and Patal Bhuvaneshwar among others. Gen V K Singh said this time two experienced liaison officers, who have better knowledge of routes and are able to take care of the elderly, will be with the pilgrims. An applicant for Kailash Manasarovar Yatra requires being in the age group 18-70 years. Apart from the External Affairs ministry, the Home and Defence ministries, as well as governments of Delhi and Sikkim, also make arrangements for the pilgrimage.